Product prices and availability are accurate as of 2019-04-10 08:22:32 UTC and are subject to change. Any price and availability information displayed on http://www.amazon.com/ at the time of purchase will apply to the purchase of this product. 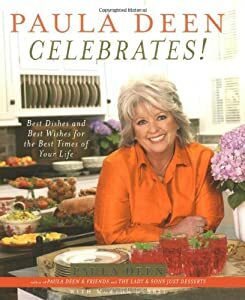 Beloved Food Network personality, restaurateur, and author Paula Deen loves a party, and in her latest book, Paula Deen Celebrates!, Paula shares with fans old and new how she celebrates a year's worth of holidays and special occasions. Now anyone can share in the down-home celebrations Paula, her husband, Michael, their kids, and extended family enjoy at their beautiful home in Savannah, Georgia. What better way to start off the New Year than with a New Year's Eve Brunch with friends—at midnight! This colorful celebration includes Crab and Spinach Casserole and Baked Tomatoes, and finishes with a quintessentially southern Hummingbird Cake and Irish Coffee. Welcome St. Patrick's Day, Savannah style, with Lamb Stew and Green Grits Pie. The centerpiece of an Easter dinner is a Peanut Butter-Glazed Ham, accompanied by Spinach-Swiss Casserole, Squash Boats, and flaky Butterhorns, with a bonus recipe for Ham Salad that makes eating leftovers a treat. Looking for a reason to party, south-of-the-border style? Try Paula's Cinco de Mayo Fiesta menu, with Macho Nachos and a cool and creamy Margarita Mousse. Paula honors the memory of her mother, and all the other women who have blessed her life, with a Mother's Day Tea of dainty sandwiches and irresistible cookies served on her best china, and fathers get their due with a Father's Day Boating Picnic. The Fourth of July is the perfect occasion for an Outdoor Grill Party and Low-Country Boil, and if what you want is a quiet evening at home, pop a movie in the DVD player and chow down on your choice of Paula's savory and sweet pizzas. Gather the family to watch some football and savor Jamie's Cheeseburger Pies, and give family and friends the gift of a sweet treat at the holidays with Paula's Icebox Fruitcake or Peppermint Bark. Her Christmas feast starts with Cranberry Holiday Brie and stars an impressive Standing Rib Roast, with Twice-Baked Potato Casserole. The show-stopping dessert is Paula's butter-laden Coconut Pound Cake glazed with coconut syrup and covered with icing and toasted coconut! Paula brings you into her home, her kitchen, and her heart with family stories and photographs. This time, her husband, Michael, sons Jamie and Bobby, and brother, Bubba, chime in to share their memories, too. Decorating and serving ideas will inspire you to use what you have to carry through a theme to make the most informal meal special. And Paula shares her most private thoughts in a special feature—Paula's Pearls of Wisdom—which you'll find with each menu. Paula Deen Celebrates! is Paula at her very southern best. Join her in making and sharing her best dishes for the best times of your life. 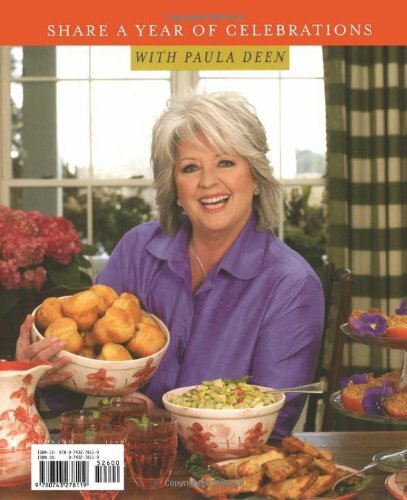 Fans of Food Network star Paula Deen enjoy her unpretentious Southern-gal persona as much as her easy, what's-not-to-like recipes. As a writer of four other cookbooks, including The Lady & Sons Just Desserts, restaurant owner, and purveyor of her own product line, she's also something of an entrepreneur. In Paul Deen Celebrates! she offers 170-plus recipes arranged by menus for traditional holidays and other, sometimes whimsical celebrations like Elvis's Birthday and Movie-Watching Pizza Party in Bed. The recipes, which are often Southern-rich, range from the more traditional, such as Shrimp Etouffé, Muffuletta Sandwiches, and Macaroni Salad, to the innovative, including Collard Green Wantons, Grilled Chicken Pita, and Scallop and Bacon Pizza. Her sweets include the likes of Old Fashioned Banana Pudding, Gooey Toffee Butter Cake and Margarita Mousse. Offered also are decorating tips, and "Paula's Pearls of Wisdom" like "treasure today's moment's because they will tomorrow’s memories."